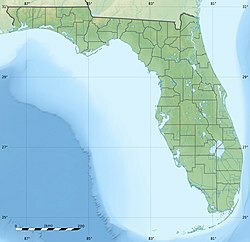 Port Manatee is a county-owned deepwater seaport located in the eastern Gulf of Mexico at the entrance to Tampa Bay in northern Manatee County, Florida. It is one of Florida's largest deepwater seaports and also regarded as the closest U.S. deepwater seaport to the Panama Canal. The port handles a variety of bulk, breakbulk, containerized, and heavy-lift project cargoes. ^ "History - Port Manatee". Manatee County Port Authority. Retrieved April 18, 2018. ^ a b c d "Port Facts - Port Manatee". Manatee County Port Authority. Retrieved April 18, 2018. ^ "About Us - Port Manatee". Manatee County Port Authority. Retrieved April 18, 2018. This article related to ports, harbors or marinas is a stub. You can help Wikipedia by expanding it.